Delengua is a small, dynamic language school which specializes in Spanish language and culture and runs courses throughout the year. It is one of only a few Spanish language schools that is located in the very centre of Granada. Delengua was founded in 1997. Our team consists of young Spanish teachers all of whom have graduated in linguistics and have relevant teaching experience. Their dedication and passion for teaching is apparent both inside and outside the classroom. 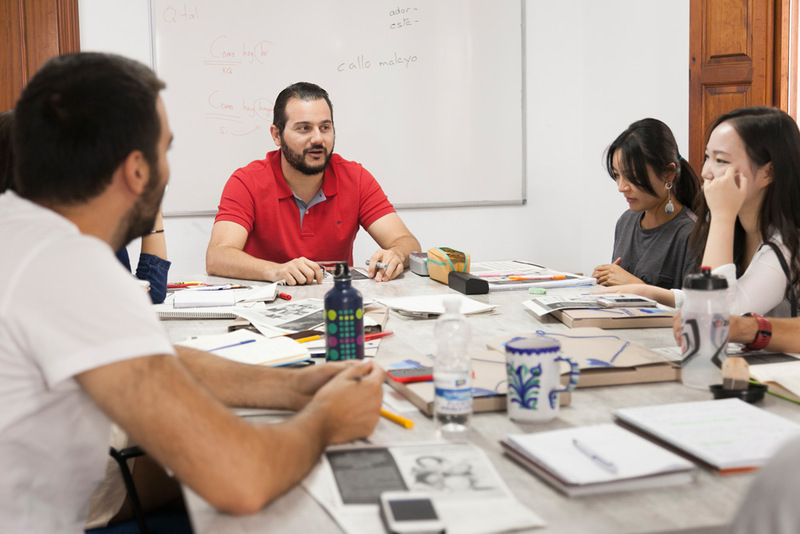 They ensure that our Spanish courses are taught in a fun and relaxed environment so that students enjoy their classes and therefore that progression with their Spanish skills is guaranteed. Our Spanish courses are focused on communication and action: the main priority is effective communication and correct situational usage. Thanks to a carefully designed programme covering all aspects of language, a great number of different topics are covered in an intensive manner so that maximum progress is guaranteed. The curriculum used by our experienced teachers is focused on a direct communicative approach. As a result of this, the dynamic courses involve active participation from all students. The number of students per Spanish class, between 2 and 8, reinforces this approach and strengthens the student-teacher relationship as well as improving fluency. From 1 week to 12 months. Intensive Spanish courses consist of four classes per day, Monday to Friday. 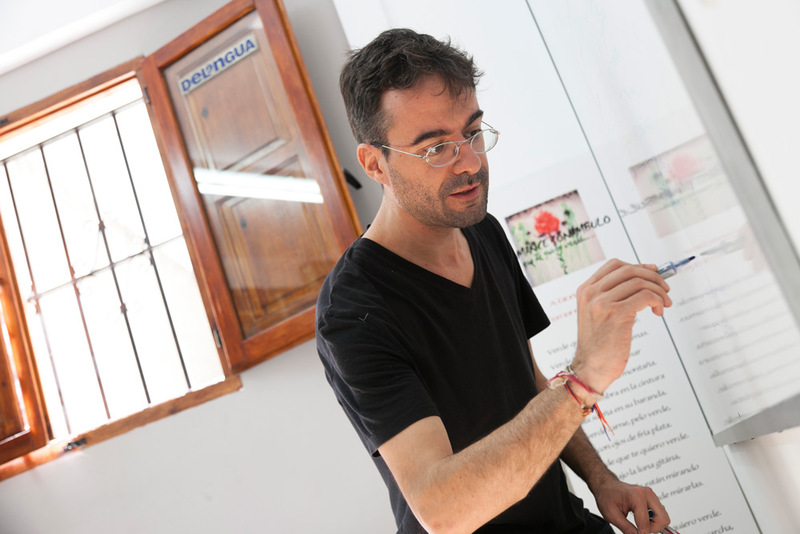 Intensive-plus and Special Spanish courses consist of 5 or 6 classes per day. In all cases one class equals 45 academic minutes. The size of each group varies from 2 to a maximum of 8, so that each student has the opportunity to actively participate. Even if the minimum number of participants is not reached, the class will take place, but the time of the class will be decreased. Up to six different levels are offered at the beginning of each Intensive course, ranging from basic to proficient Spanish users. We ask you to complete the Spanish level test on our Website the week before your course starts. The results, together with your own self-assessment and an informal conversation on your first day of class, will help us to determine what level of Spanish is most suitable for you. It is usually possible to change levels during the course. A certificate which confirms the type of Spanish course, duration, intensity and level will be awarded to those who regularly attend their Spanish courses. This course is intended for absolute beginners and offers an introduction to basic elements of the Spanish language. Explanations of the more complex grammatical structures will be provided in English. Grammar Focus: ser and estar; present, perfect and future forms of regular and irregular verbs. Communicative exercises, roleplay, and informal expressions are also provided to help you learn how to use Spanish in everyday situations. After some revision and consolidation of the basics, this course focuses on the forms and usage of the past tenses (imperfect and indefinite). Authentic materials such as easy newspaper articles, comics, songs and simple literature are also used. Conversational practice will increase your confidence to take part in simple discussions. The grammatical focus of level B1 is on indicative tenses and an introduction to the Spanish subjunctive. The development of conversational skills is of particular importance, so you learn to speak more confidently in a variety of situations. In this course, language learning is closely associated with culture, history, society and politics of the country. Humour, songs, lifestyle, culture, history, literature, films, expressions and suggestions from students are all part of the programme. Students can use Spanish language flexibly and effectively for social, academic and professional purposes. This course will analyze typical problems presented by non-native speakers and will improve your grammatical competence in some of the more complex forms such as periphrases. Students are able to discuss with the teachers any topic or affair they would like to tackle. Students can express themselves spontaneously, very fluently and precisely, differentiating finer shades of meaning even in more complex situations. This course helps you to express your ideas in a natural and accurate manner, giving your Spanish a more authentic sound.